1896. The Pennington "Victoria" at the Nunhead Grounds. 1858 Pennington was born in Moores Hill, Indiana. He was an inventor and promoter of many mechanical devices, including airships, motorcycles, and automobiles. In addition to motor vehicles, he applied for and received patents for Stirling engines, ignition systems, planing machines, and pulleys. He often promoted his inventions with grandiose and often spurious claims, which would become a hallmark of his entrepreneurial schemes. Frequently he collected financial backing for his business ventures, but rarely did his investors ever collect any dividends from his projects. He was regarded by many as a fraud on account of his unproven claims and business practices, yet he never spent any time in prison as a result of these accusations. Pennington married three times, but never had any children with any of his wives. He demonstrated his developments at a bicycle exhibition where he attracted the attention of Thomas Kane, an established manufacturer who acquired the patents. 1895 October. He visited England as part of the agreement made by Thomas Kane when he licensed the English versions of the Kane-Pennington patents (on engines and vehicles) to an English syndicate (this was presumably when the motorcycle patents were acquired by Harry John Lawson). 1896 Lawson had two more prototypes built at Humber but nothing further came from the design. Pennington made many claims for his motorcycle, but it is doubtful if any of them are true. The design was very primitive and a few journalists of the time expressed doubts as to whether or not it would even run, though The Autocar reported in June 1896: "...although the motor required some little alteration, the speed developed was said to have varied from thirty to forty miles per hour." Notable features were that the engine's cranks were connected directly to the rear axle, the cylinders had no cooling fins, and Pennington made use of balloon tires - an invention he is also often credited with. The only surviving example of the Pennington design is preserved by the National Motor Museum in Beaulieu, Hampshire, England. After his motorcycle plans came to nothing, Pennington working in conjunction with Lawson attempted to design a car bearing his own name. Although payments were taken for orders of this design, apparently none were ever delivered. 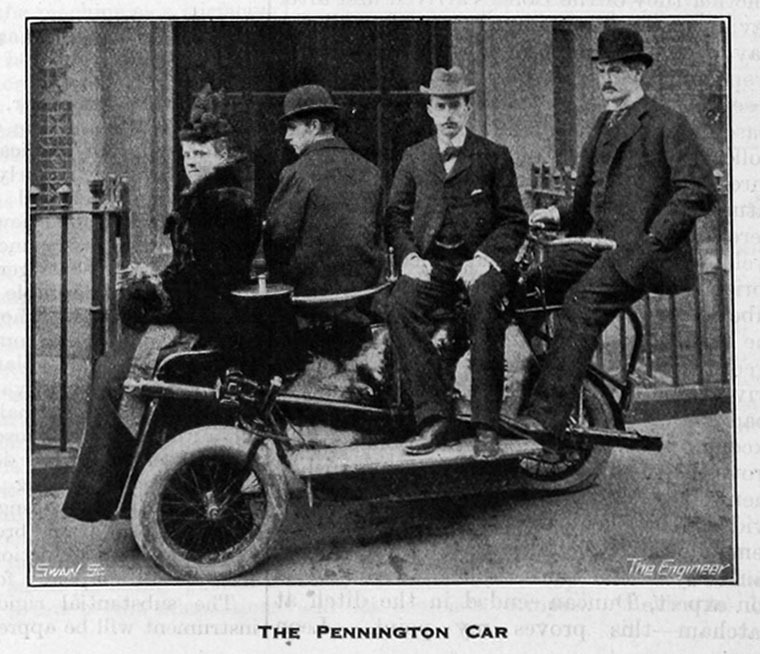 Journalists speculated that the car was a failure in design, and The Horseless Age remarked sarcastically that: "...the Pennington car, which is not a car, since it does not carry, but has to be carried..." was partly responsible for bad press about the automobile in general and Lawson's motor syndicate in England at the time. 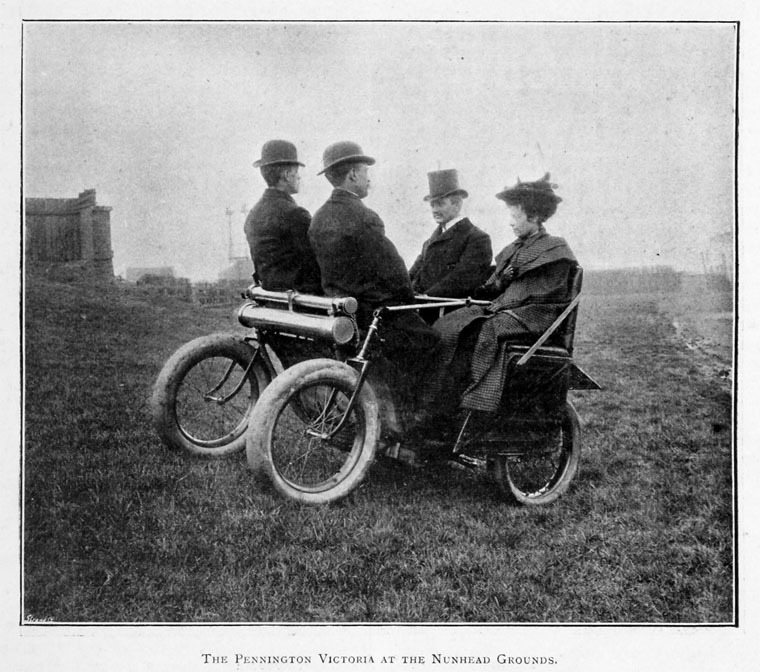 1897 Mention in connection with the Motor and Cycle Co of Ireland. 1899 A company called Pennington and Baines established agencies in various parts of the country for the New Pennington motor cars. Pennington returned to the U.S. and attempted to promote a few more schemes, as well as collect money he thought people owed him for his patents. 1911 March. Died in Springfield, Massachusetts, age 53, after contracting meningitis from falling down in the street. Mr. Pennington "Air Ship" Pennington, as he delights to be named was born in 1858, and at the age of thirteen became an apprentice in the shops of J. A. Fay & Co., in Cincinnati. He was for eight years in the shop, and then began ventures of various magnitudes on his own account. He first thought of air ships in 1885, while president of the Pennington machine works at Fort Waine. He built his air ship in St. Louis in 1890, which is a matter of prominence in aeronautic history, and also in 1890 first applied a gas engine to a road vehicle. DUBLIN is greatly concerned at the prospect of that city being made one of the leading centres for motor-car building. The Dublin papers state that Mr. Pennington has arrived with the object of extending his manufacturing business in Ireland. His motors are to be seen running around Stephen's Green at the rate of 12 miles an hour, and not in the slightest degree interfering with the public traffic. This is evidently only the beginning of the introduction of a number of similar machines. Already arrangements have been made for the adoption of auto-cars to carry passengers and to make a connection between railway termini and the steamboat lines in different parts of Ireland. A company has been organised to erect in Dublin an immense manufacturing place for the purpose of building cars, and will be known as "The Irish Motor-Car and Cycle Company (Limited)." This factory is to be run on American lines for the manufacture of motorcars, cycles, &c. Mr. Pennington is at the present moment considering a number of sites for the purpose, and his mind will be made up in the course of a few days. He wants a site with acreage sufficient for the establishment of a huge series of workshops, with plenty of space for future extensions. The necessary tools, lathes, &c., for the works are now on their way to Ireland from America. The first factory will employ 2,000 hands, who will be chosen from amongst the skilled and unskilled workers of Ireland and placed under trained Americans, who will act as managers of departments. They will start the concern with orders in hand for cars, &c., to the value of £140,000. When the motor-car business extends, as it must extend as surely as night follows day, an industry will exist in Ireland second only to the great brewery of the Guinness firm. This page was last edited on 23 February 2018, at 01:06.